Posted June 7, 2016 by Larry Lipman & filed under General. Does your team have this kind of trust? Successful productive businesses have strong cohesive teams. Not just groups of talented individuals working independently, trudging along to reach a somewhat unified goal or idea. To have a productive team, trust among team members is key. There is a fun quote mentioned in an article from ERE Media that hits the nail of the head in regard to trust. “A relationship without trust is like a cell phone without service. All you can do is play games.” (Origin Unknown) What is a team without trust? Not really a team, that’s what. So how does a team of potential strangers start to formulate trust? Here is insight regarding ways to begin the process. The best place to start is to step back and look in the mirror. Since you can only truly control you, it’s important to make sure you trust and respect yourself first. When joining a new team via a new job or a new project, be genuine, but thoughtful. Team building with trust takes time. Unfortunately, trust can be shattered easily with one thoughtless action or comment, so you must be careful. The first thing to do to build trust is to get to know your team members. Successful teams know each other, beyond their skill set and job titles. It is not necessary to get overly personal, but it is important to let coworkers know a little bit about your family situation and interests. Sincerely reach out to all team members equally. If a team member reaches out to you, accept the overture in order to get to know them better. Nothing is worse than snubbing someone you haven’t even gotten a chance to know. You do not want to isolate a team member. They might subconsciously harbor resentment toward you from that point forward. That means disaster for team continuity. Everyone knows that the actions of the team leader are inevitably mimicked by the entire team. In a Mindtools article, trust is said to be a reliance on the character, ability, strength, or truth of someone of something. Trust then starts with the team leader. The team leader must set the example, always. You’ve heard the saying “Fish rots at the head”. If your team leader is rotten, pretty soon the entire team rots as well. Therefore, a trustworthy leader invokes trust in the rest of the team. The most effective way is to invoke trust is to give it to others freely unless otherwise compromised. If the team leader demonstrates trust in the team, the team will trust one another. Make sure everyone on your team is talking to one another openly, honestly and most importantly, with respect to one another. One way to do this is to meet on a regular basis to share ideas and brainstorm on obstacles. Is possible, face-to-face meetings are the most effective. This helps the team really get to know one another’s ideas and opinions via focused interaction. Need Help Building Trust in Your Team? 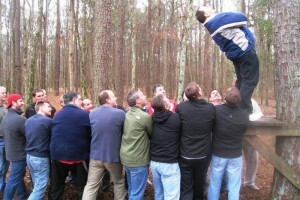 Larry Lipman of Fun Team Building can help you develop strong trust building activities. He has worked with teams for over 20 years. His expertise in custom team building activities can help you cultivate a trustworthy team. To learn more or schedule an event, call Larry at 770-333-3303 today!